Here I am at my Country Inn. I’m scheduled for a little adventure today, but before I take off I need to explain a few things about how Country Inn Days work. Inn Days are days of imagination. 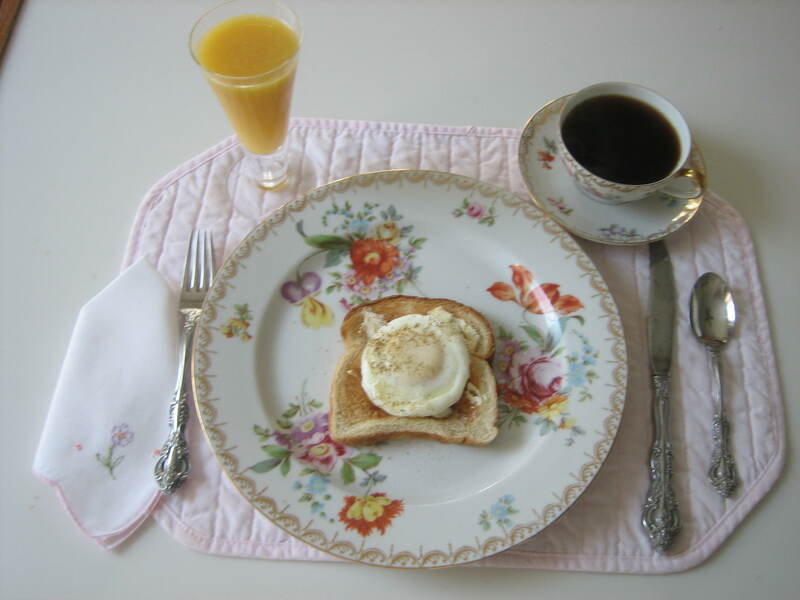 I can enjoy sharing breakfast, lunch, tea, cocktails and/or dinner with other inn guests and not who you might think. Inn guests are usually interesting spirits of the past, but sometimes they are spirits of the present too. The critical word here is spirits. These spirits arrive at my Inn for a few days at a time, usually from the library or the local book shop. They are the spirits of people contained in biographies. Many of these spirits become what I like to call my “dead friends”, but others are still alive and well. You see, with imagination a biography can bring a spirit to life. 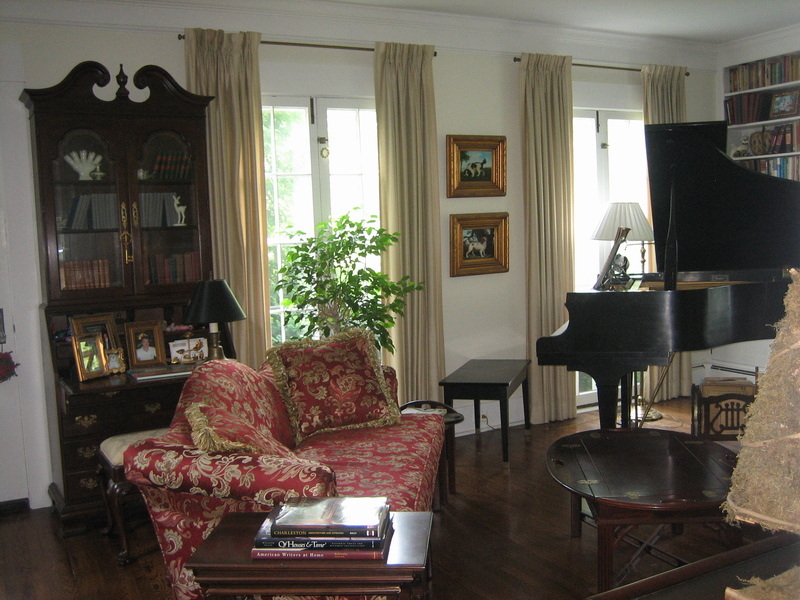 With imagination I can enjoy the company of all sorts of great and famous spirits who become guests at the Inn just as surely as I can enjoy visits with living, breathing friends. Imagination does it all. I invite some of these spirits to be guests, but others sort of come on their own. This is how it works: I go to the library or book shop each week and select biographies. For chance to work I close my eyes, pick a few more books, and voila! The Inn has an interesting and varied guest list! After all, we’d have no control over the guests who might be staying at a real Inn so why should the Inn of Country Inn Days be any different? Fun, huh? Well, guess who’s one of the interesting people who checked into the inn this week. He was my companion for breakfast today. 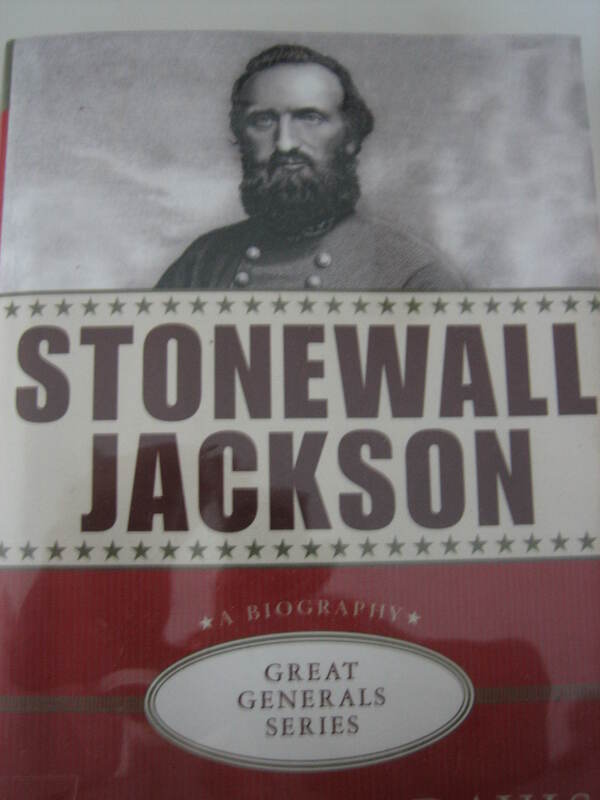 Yes, it was Stonewall Jackson. He joined me with the help of a wonderful book written by Donald A. Davis. I knew very little about Thomas Jackson before breakfast, but after I spent just a little time with the man I can say I really like and admire him. Did you know he made it into West Point even though he was just a roughhewn frontiersman, not an educated gentleman from a prosperous family like the other newcomers to the school? He said, “I knew I was very ignorant, but I had the energy and the intellect to succeed.” I love that sort of confidence in a person, don’t you? Over a breakfast of poached egg, orange juice and coffee I sat spellbound as Tom told me details of his life – how he swung 28,000 soldiers out of the front line, moved them across the front of the enemy, and outflanked the Union army in one of the most important battles of the Civil War. I learned the South always thought they had a chance as long as Thomas was around, but sadly hecame to his end when his own men fired upon him as he was returning from a scouting mission. They mistook him for the enemy. He had been hit three times and lay mortally wounded. Several days later, with his left arm amputated, he died of pneumonia brought on by his wounds. I hate sad endings, but Jackson’s life was one to be proud of and I look forward to getting to know the man better. Hearing the stories of such dynamic people is nothing but inspiring. 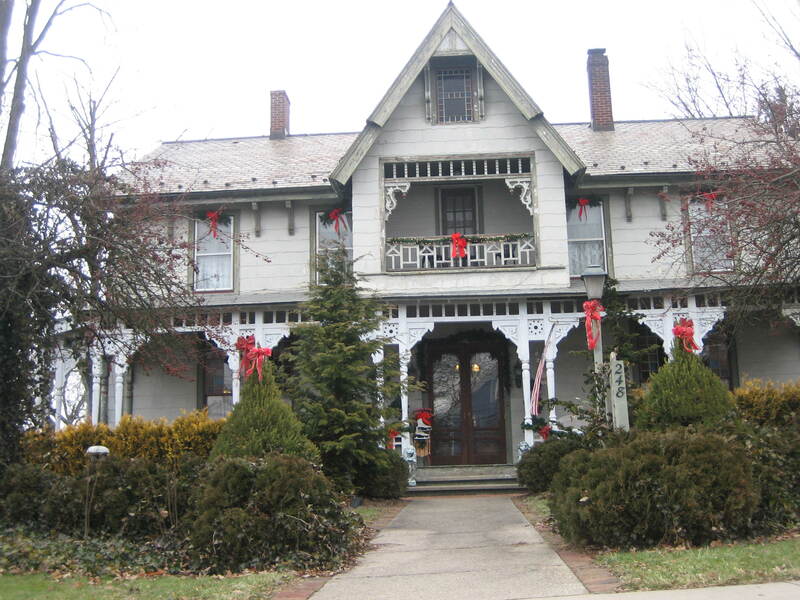 I’m so glad Stonewall Jackson is here at the Inn. I shall look forward to hearing more of his adventures, but it was time for a little adventure of my own. Today’s Adventure Day took me to a town called Ravenna. 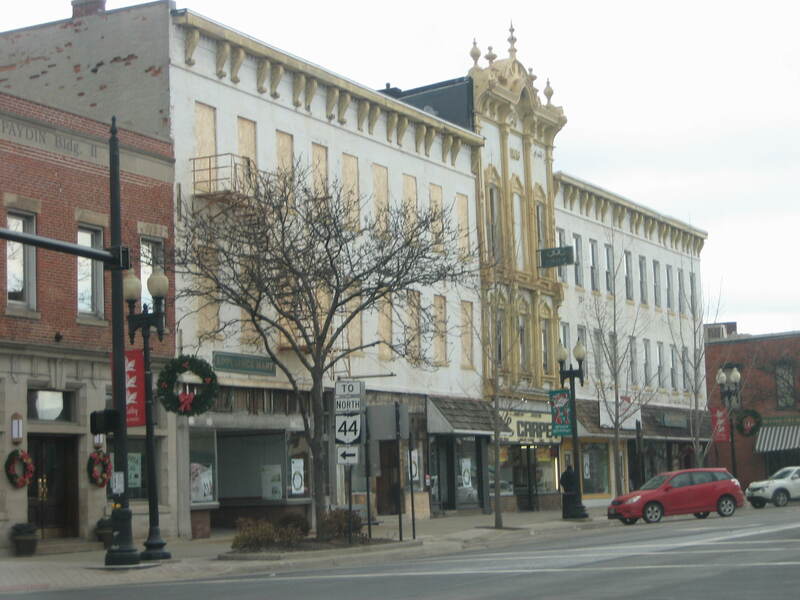 Ravenna is very much “Main Street USA”. 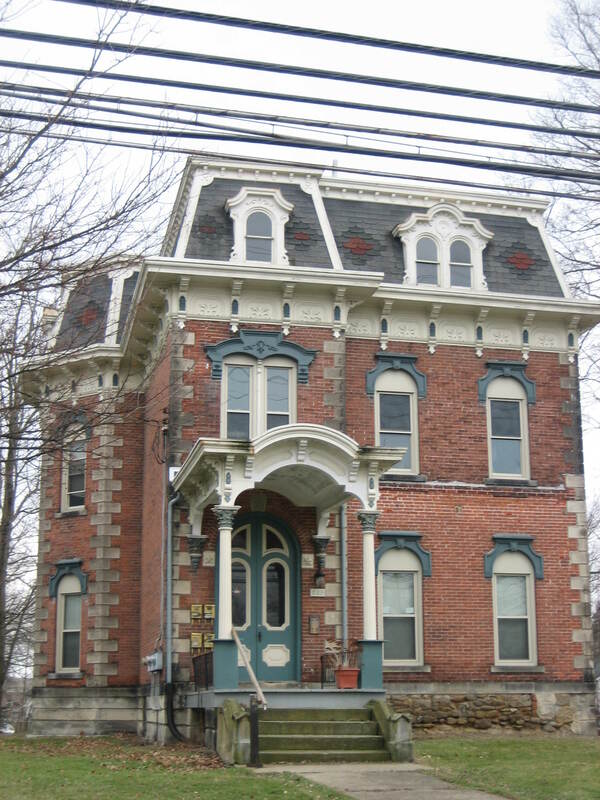 It was founded in 1799 and developed throughout the 1800’s. The downtown area is full of nostalgia, reminiscent of a time when Main Street was a place where people would congregate, converse and do business. I happen to love historic towns. 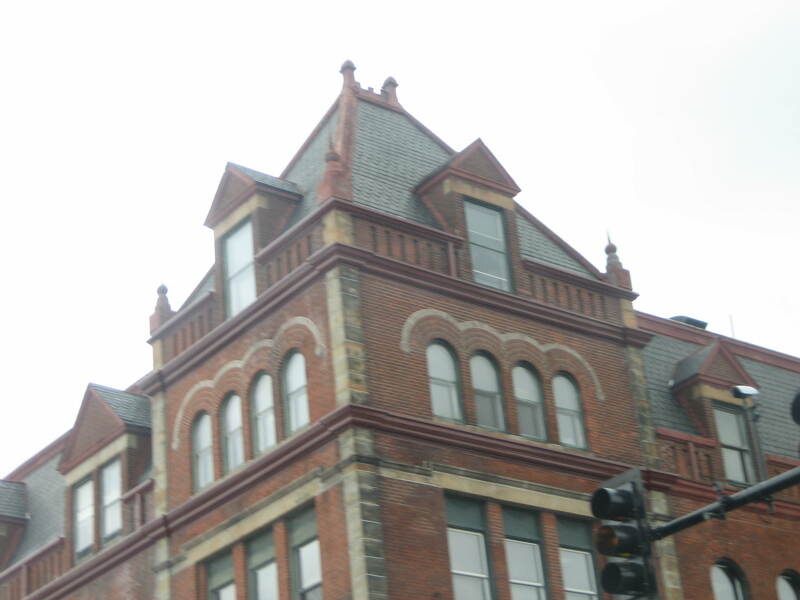 I love the architectural detail found in the old buildings of old towns. Maybe it’s my years living in Boston, but I’m always looking for old places to explore and I found one today. 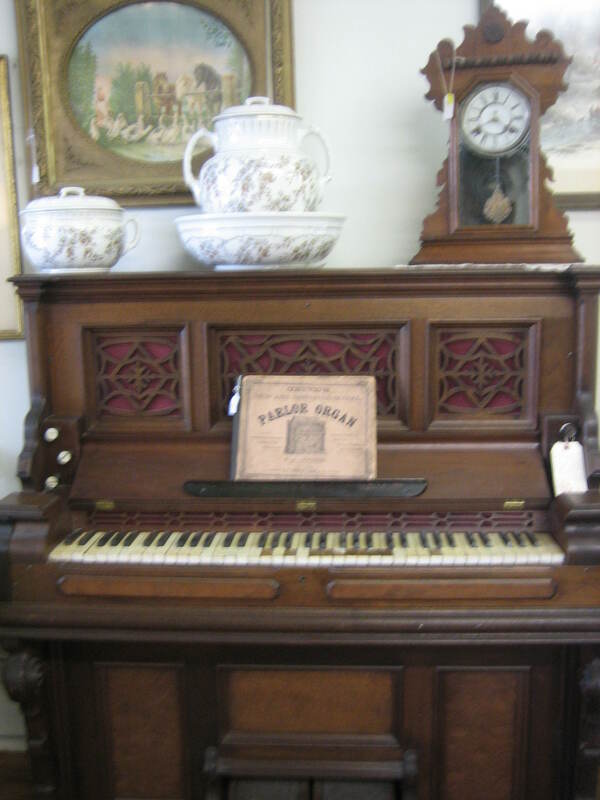 Here in Ravenna I found a big, old antique shop full of treasures. The building is a treasure in itself. 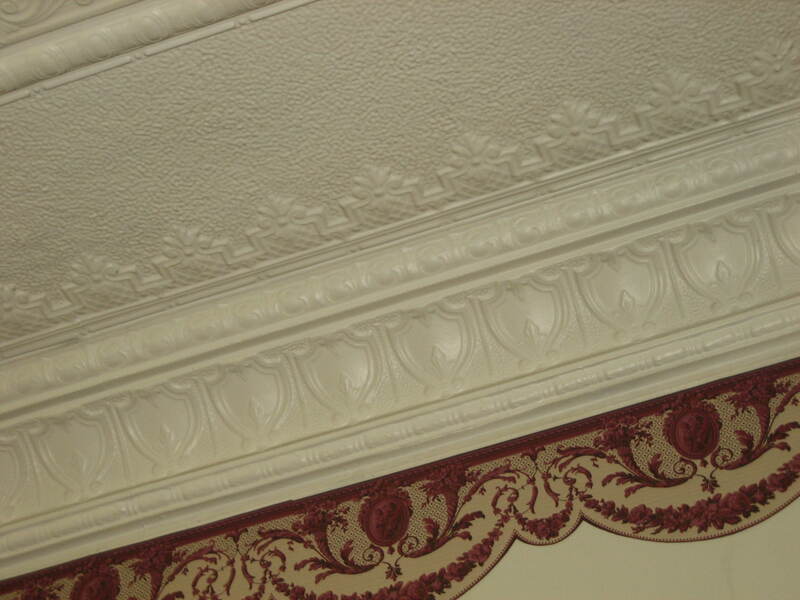 Just look at the detail at its ceiling. They don’t make ’em like that anymore. I love all things old so I was in my glory here. 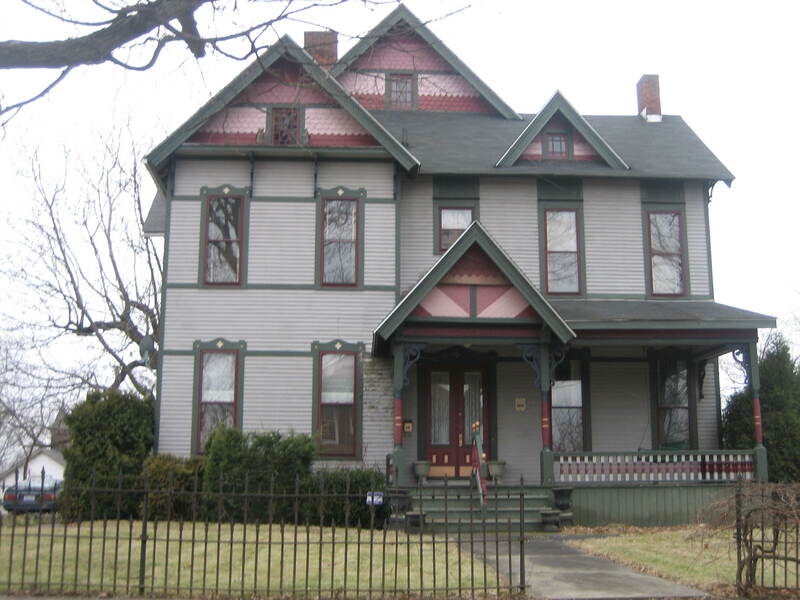 What an adventure to look at household items that were used by people of the past, people like Stonewall Jackson. It’s a little like going back in time, isn’t it? Of course I was hoping to find some treasure I could take home with me too, a souvenir of my Adventure Day. What would it be? 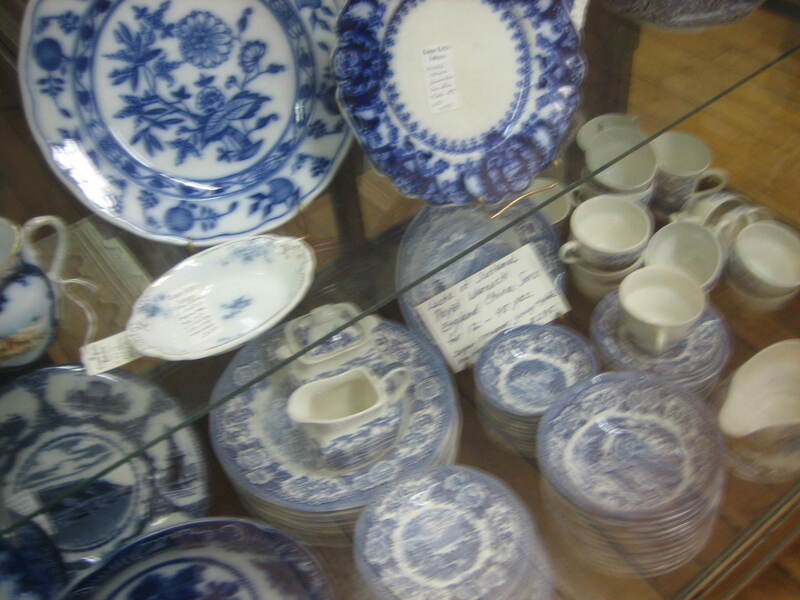 This china was absolutely beautiful, but my cupboards are bursting with china already. I dare not add more, at least not until I add more cupboards. 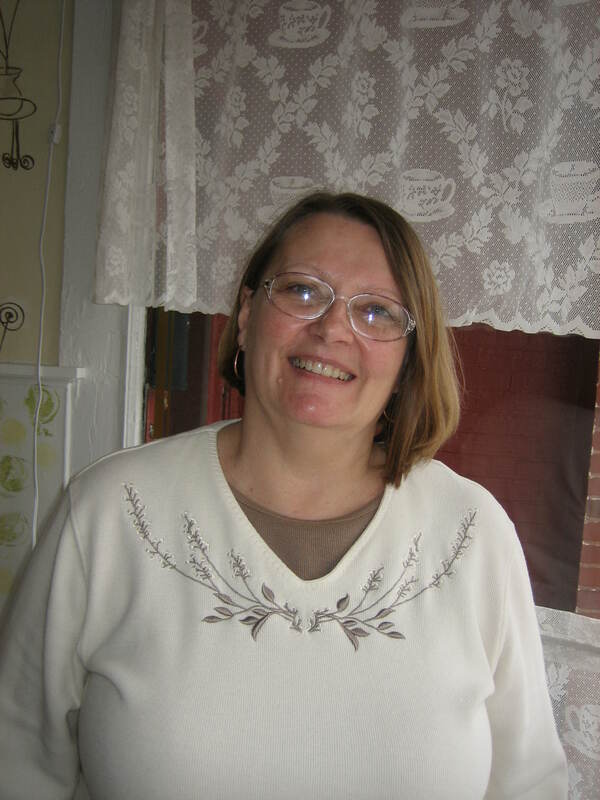 I’ll keep you in suspense as to what treasure I found today, but let me now introduce you to a nice lady I met here. This is Pam. 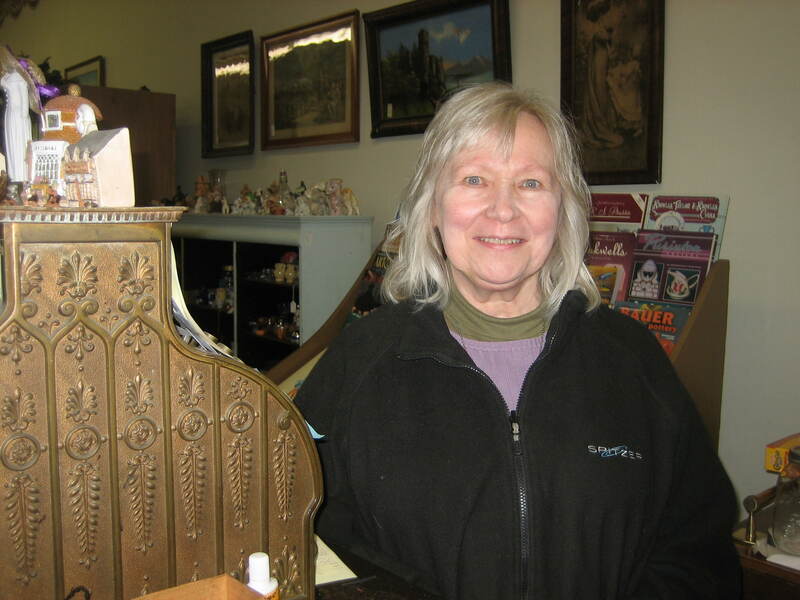 She is one of the antique dealers responsible for this shop and she is a very nice and engaging lady. On Adventure Days I not only discover places and things, but I’m happy to say I also discover very interesting people, people who sometimes become great friends. I hope Pam will be a future guest at one of my Sharing Teas on another Country Inn Day so she can tell me all about her passion for antiques and how she got into the business. We had a very fun chat at the shop and I know she’d be an entertaining companion at tea. But it’s time for refreshment and speaking of tea Pam told me about a tea shop a few doors down. I must investigate. And here it was. 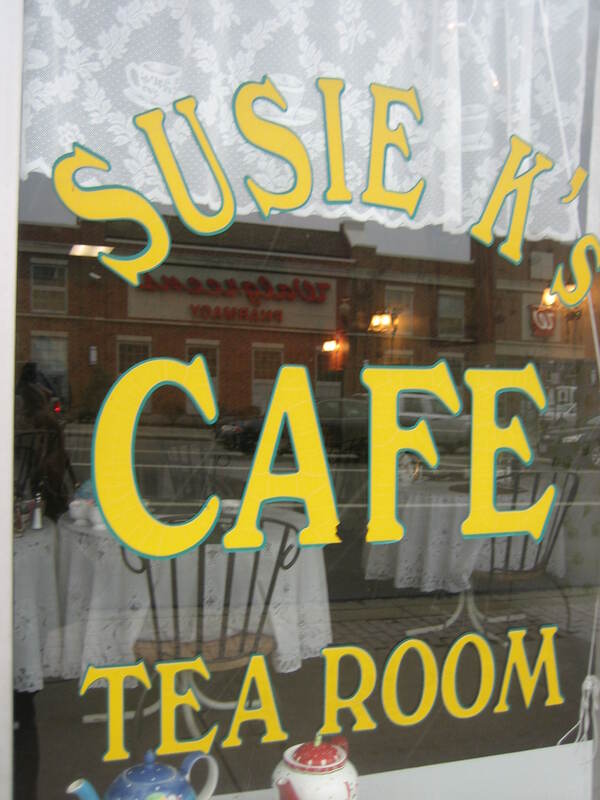 It’s Susie K’s Cafe and Tea Room. 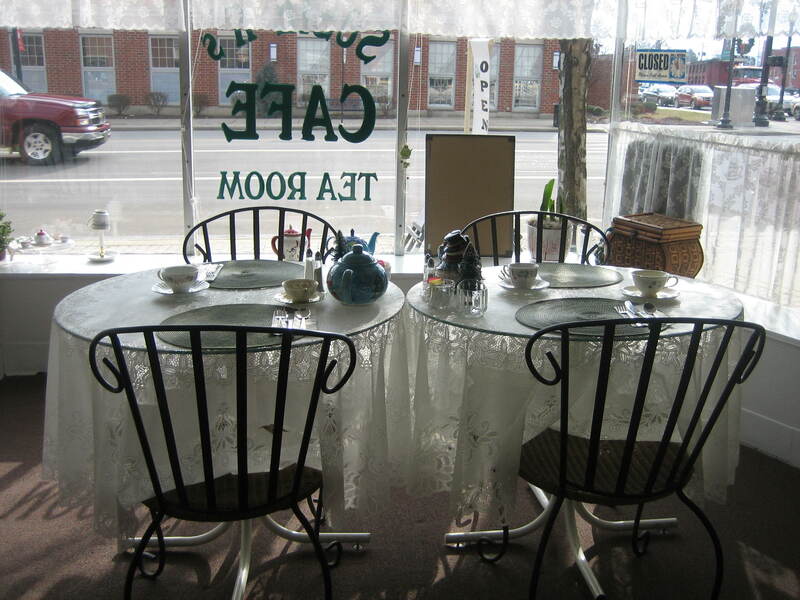 I love a privately owned and operated tea room. I guess I have a little bit of English in my blood, or at least in my spirit. I stepped inside. It’s quiet. I missed the busy lunch crowd. Good! I found a table against the wall where I could sit, relax, and enjoy the company of another “dead friend” who happened to come along with me on this Adventure Day. As I enjoyed lunch I could be entertained with her stories. Who is this person? 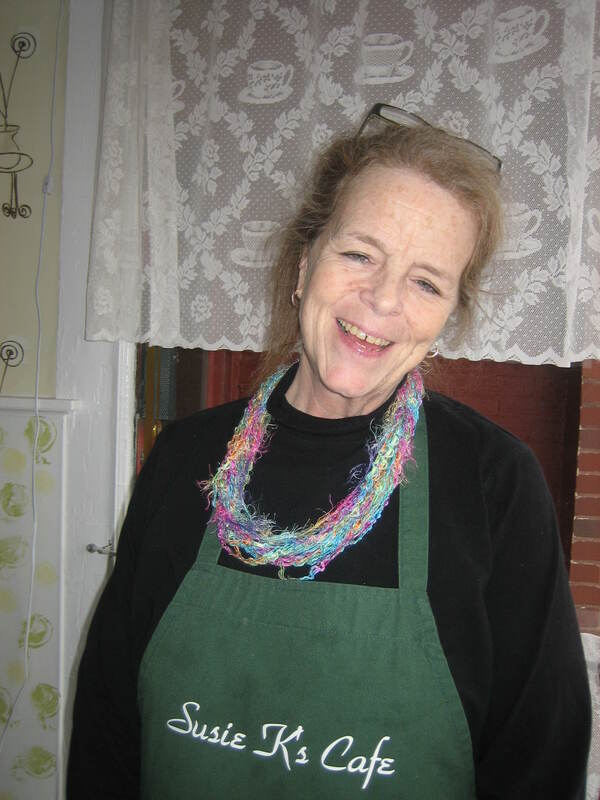 I’ll tell you in a moment, but first let me introduce you to Susie, the owner of this tea house. Doesn’t Susie K look happy? She must love her work. She was very sweet and friendly full of good old Midwestern warmth. We chatted and she told me how she rents her place out for parties and meetings, how she bakes her own pies from scratch, and how she’s always there to mingle with her guests. I liked that! She offers the personal touch. But how ’bout some tea.? It was time. 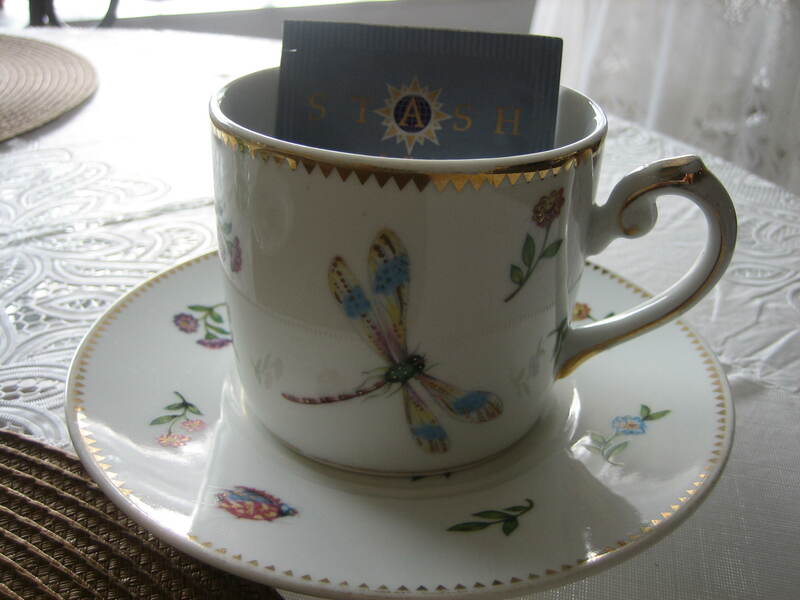 And what a pretty cup! I ordered my favorite, Earl Grey. JoDel was my server. She’s another happy person. You know it’s good to surround yourself with happy people. JoDel told me about all the specials on the day’s menu and it’s always quite the decision – what to choose. Everything always sounds so good to me. I love food, don’t you? 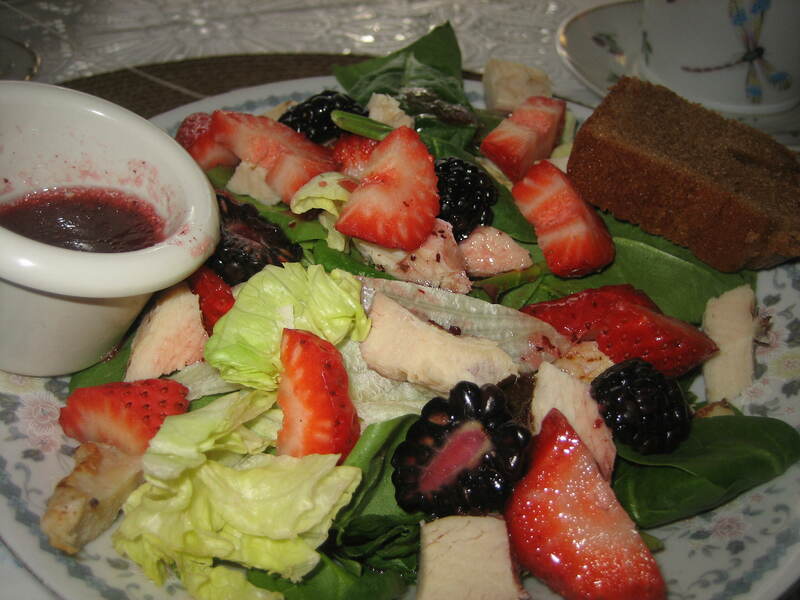 I finally selected the chicken salad with strawberries, blackberries and a raspberry vinaigrette dressing. There was a little bonus sweet bread on the side. Yum! So there I sat with my food and my tea and my “dead friend” having a yummy break on this Adventure Day. “The most important thing is to enjoy your life – to be happy – that’s all that matters”. 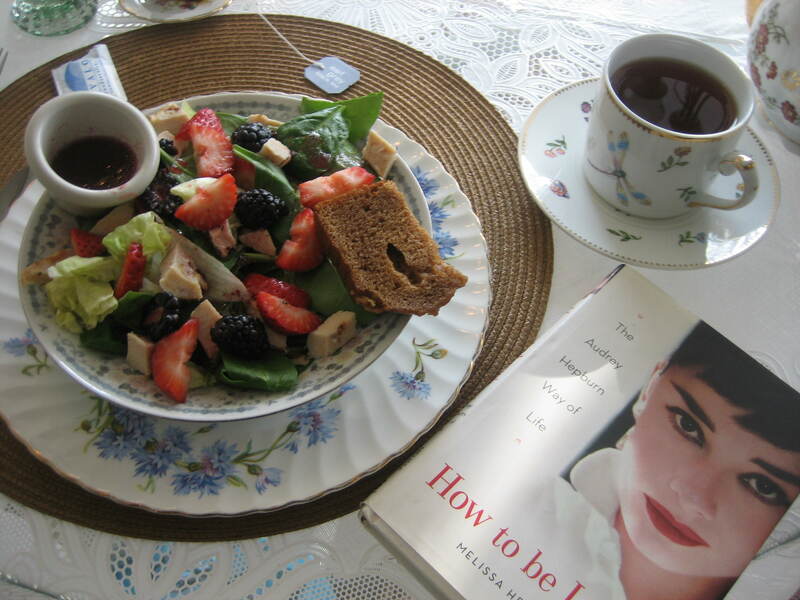 Yes, Audrey was a very entertaining companion for lunch and she always inspire me. You just don’t meet many true ladies these days, ladies who have her looks, but also her lovely spirit. Audrey could eat anything without gaining a pound. 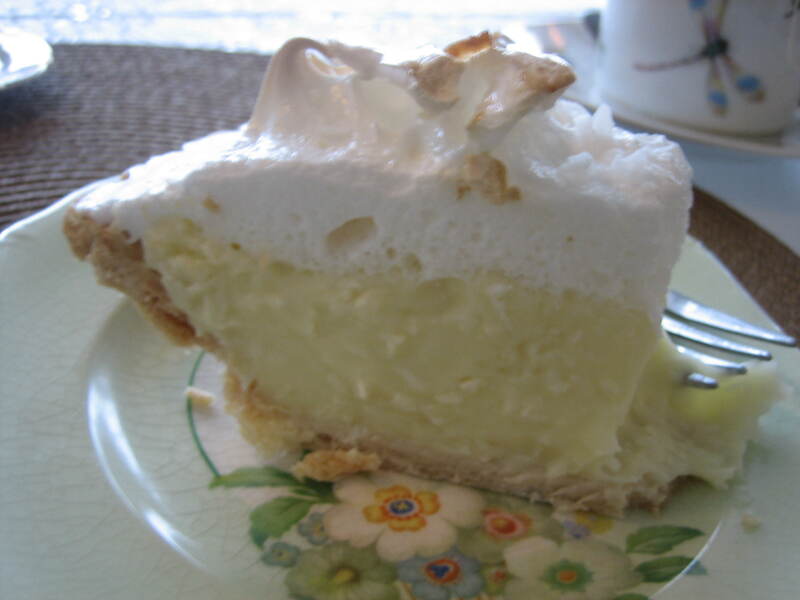 I’m not so lucky, but when I heard that Susan makes her own pies from scratch I had to try the coconut creme pie. How could I refuse it? It is a Country Inn Day after all, a day to celebrate life. 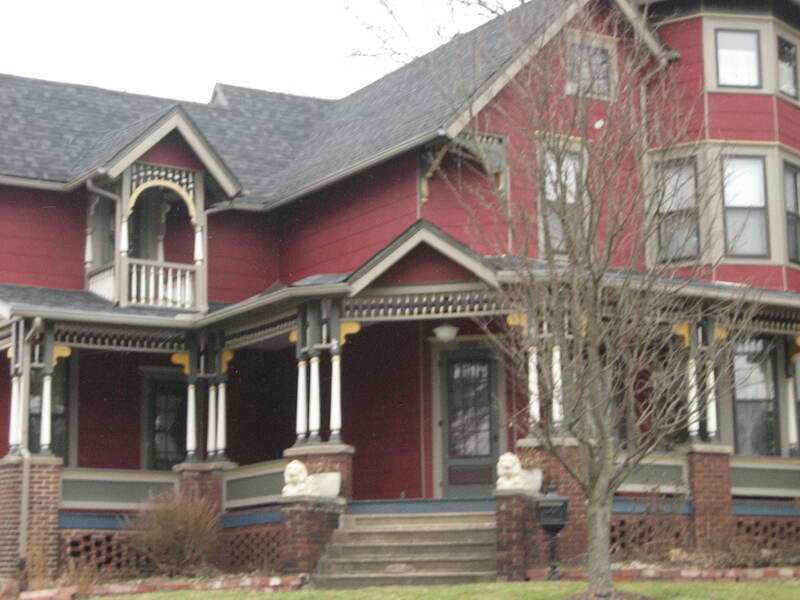 Let me show you a few of Ravenna’s haunted houses. Aren’t they great? 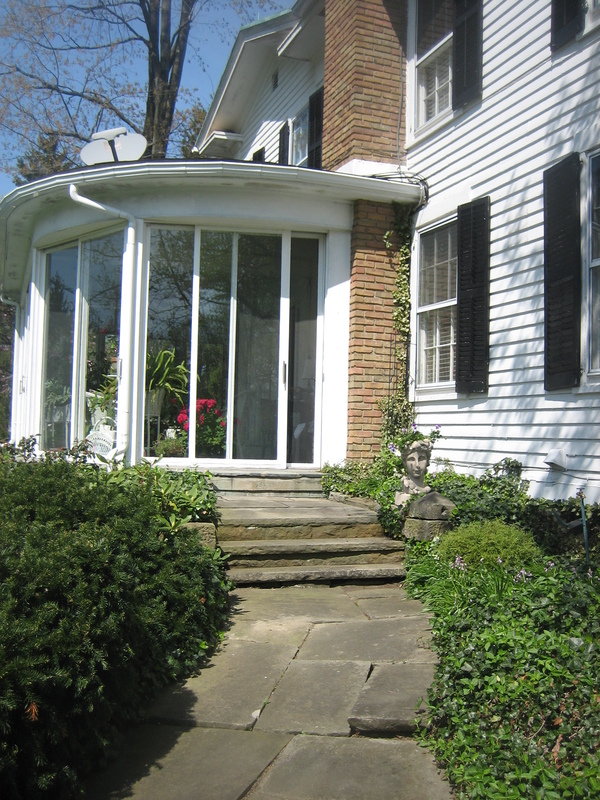 But it’s time to return to my own haunted house, The Jeremiah Brown House, and here I am at its side door. But before you go let me show you what I brought back from my Adventure Day. I brought home these lovely cordial glasses. There’s eleven of these delicate, old gems in assorted colors. I look forward to using them for an after-dinner indulgence with or without coffee on Country Inn Days or whenever I’m entertaining. I also picked up a bottle of Chambord on the way back to the Inn because fancy new glasses deserve a fancy new liqueur with which to christen them. 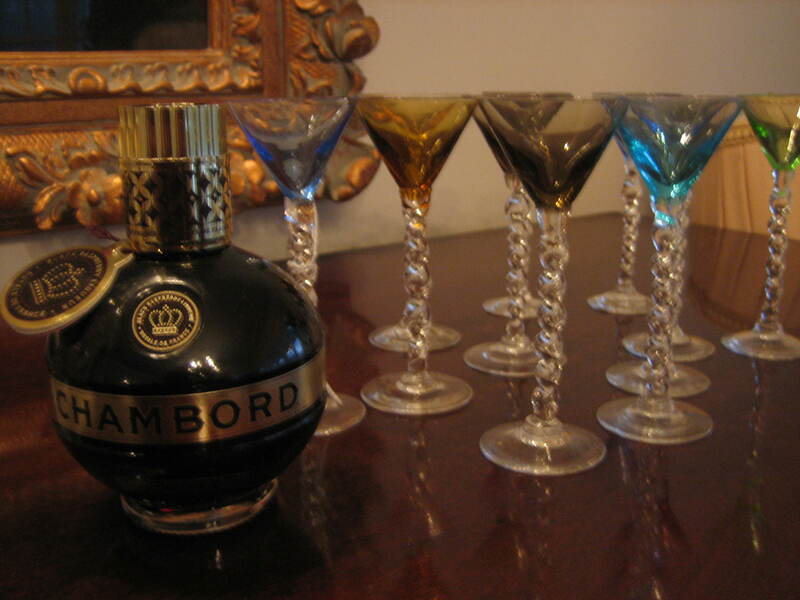 I’m told Chambord is a cordial made from the world’s finest raspberries, blackberries and the exotic flavors of black raspberries,black currant, Madagascar vanilla and cognac. According to legend Chambord was inspired by a luxurious raspberry liqueur produced for King LouisXIV during his visit to Chambord in the 17th century and if it was good enough for King Louis it’s good enough for me. And there’s one more goodie I brought back to the Inn from my Adventure Day. 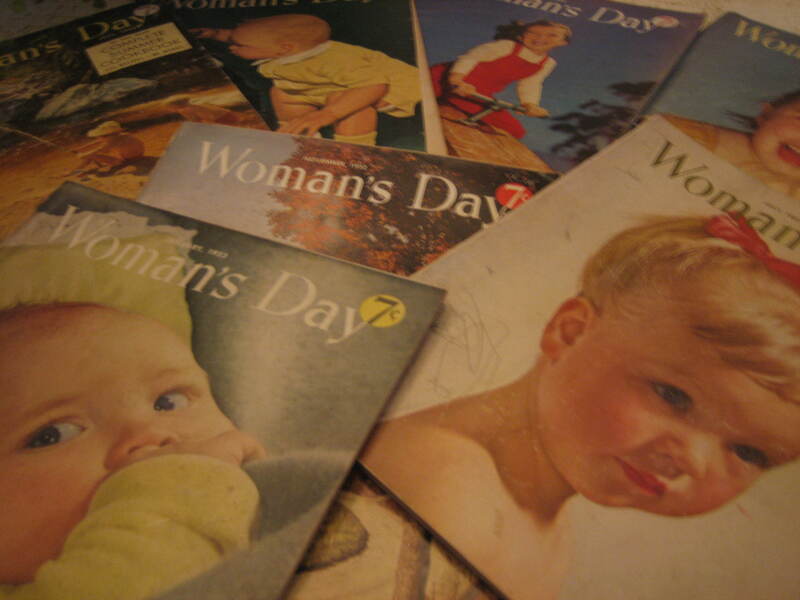 It’s a stack of very old Woman’s Day magazines. They were printed back in 1952. 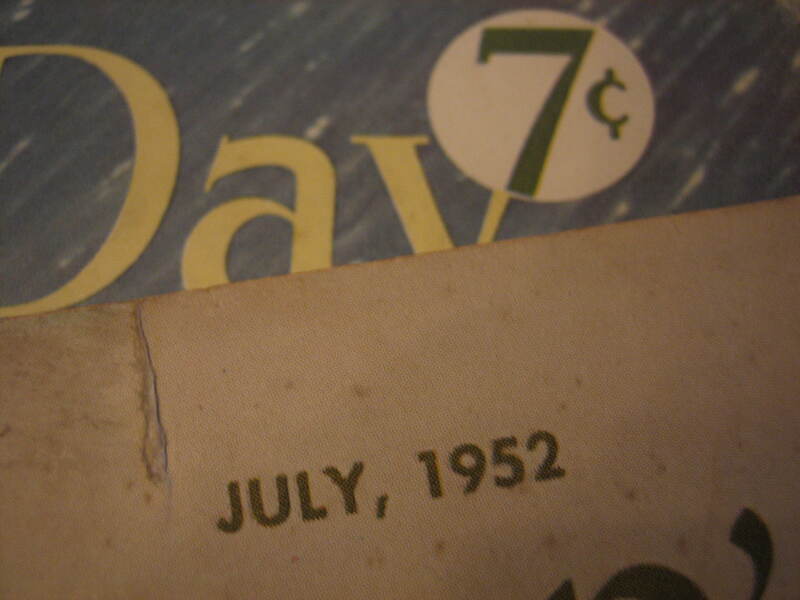 Can you imagine a magazine that costs only 7 cents? I will enjoy future Country Inn Days curled up by the fire reading the pages of these great old periodicals. So another fun Country Inn Day has come and gone. I’ve only told you about a small part of it, but next week I’ll be back at the Inn and I’ll share more highlights of these wonderful days of imagination and fun. Now let me wish you happy days and leave you with some words from my lovely “dead friend’ Audrey Hepburn. Words, Words and more Words. What would we do without Words? You sure know how to live !!! What a beautiful post!! You make me want to go to that lovely town, meet all those friendly people, and have a piece of that delicious looking pie. 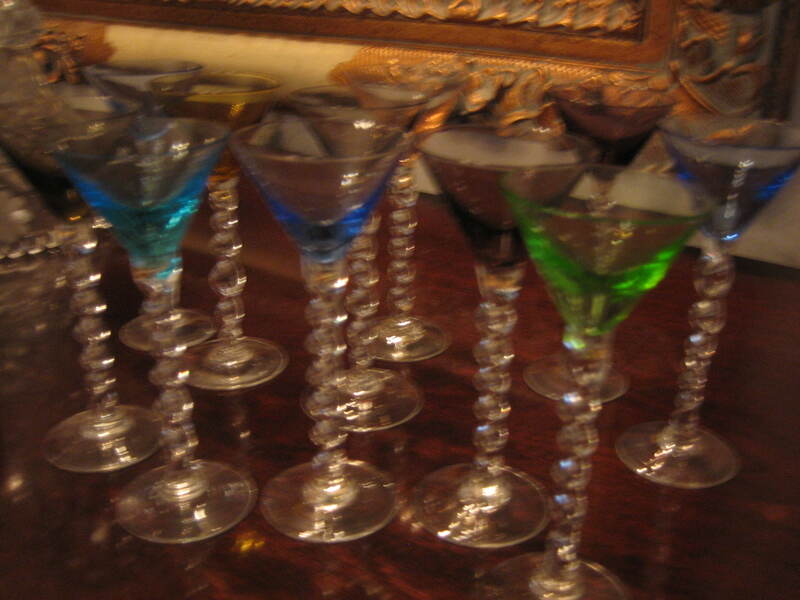 I love your beautiful new cordial glasses and your choice of liqueur to fill them!! It really was a fun day. It isn’t hard to have a fun if we use our imagination. A little shopping never hurts either. It was nice to see your note. You’re always so kind.